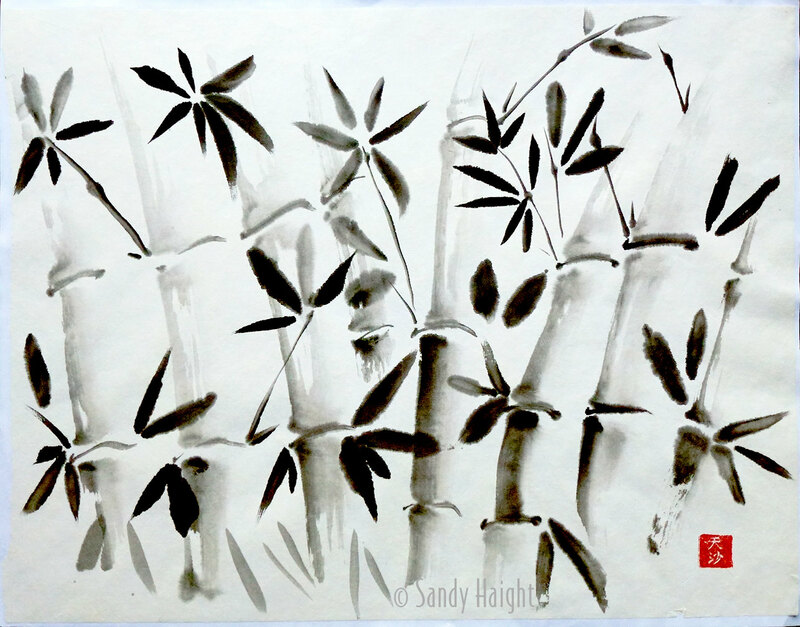 This sumi painting has a soft and gentle feeling of the bamboo as we peek into a cluster of shoots. Bamboo is a traditional subject for practicing the art of sumi brush painting. "The Bamboo depicts summer and is the most painted subject in the Orient. It represents strength and the virtues of the male, reflecting a sense of perfect balance with upright integrity and tremendous flexibility. The "Perfect Gentlemen" with many admirable qualities. The center of the bamboo plant is hollow, suggesting humility. The bamboo seems always ready to be of service and is used in the Orient on a daily basis. The bamboo plant bears no flower or fruit which are considered temporary make-up. The bamboo is thought of as the Father of brush painting, representing simplicity of life and a humble spirit.." Quote from silverdragon.com. There are a few bamboo paintings in my shop. Check them all out to see which you like most! This is an original, not a print. Painted on rice paper with sumi ink, the painting is mounted on masa, a white paper, to flatten it and bring out the richness of the tones, signed with my name and my personal red chop. It's delivered on foam core with a clear bag to protect it while it awaits your choice of frame to add grace and beauty to any room in your home. Artwork comes with a signed Certificate of Authenticity. (The copyright notice is not part of the product, just protecting use of the image file). Image size 17.5" x 13.75"
In 2012 I qualified to be a signature member of the Northwest Watercolor Society (NWWS). This is earned by being juried into a select number of local chapter and international watercolor society shows sponsored by NWWS. The initials now follow my signature on my paintings that you can see in the Floralscapes section of this shop.